McDonald’s has always been considered a symbol of American imperialism, an exporter of cultural ideology known as “the American way of life.” McDonald’s is the undisputed leader of the fast food industry as far as global reach, gross income, and number of outlets. Its business model is based on a strong tendency towards decentralization in which each business unit operates in the local context as a type of partially independent satellite. This autonomy is in fact limited by the coordination of activities by the head office, and is summarized by the words repeated in each annual report: “Local Freedom Within A Global Framework”. While maintaining consistency with its system, in recent years the company has been changing its strategic orientation, seeking to respond to globalization by changing not so much its organizational structure, but its development process. In its approach to international expansion in foreign markets, the firm is increasingly forced to adapt to local environments, integrating globalization and localization in one profile “glocal.” Although this is a company of American origin, its management, suppliers, and employees are tightly bound their specific locale, as if the company were disregarding its origins. McDonald’s is in this sense becoming more and more local, although in the past it has proved to be a company with strong global connotations. In particular, McDonald’s is trying to adapt its “brand promise” developed at the global level to different local realities; this along with other initiatives that are slowly moving the company toward changing not only the “face” in each country where it has outlets, but even its “skin”. 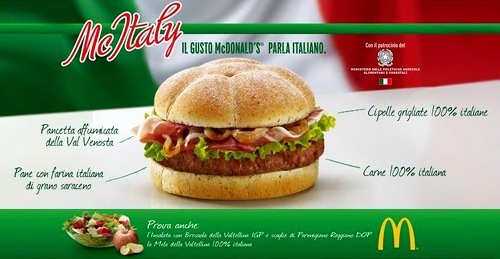 In Italy, for example, giving a typically local connotation to the brand, the tagline will probably be turned into “I’m lovin’ Italy.” One sees this in many advertising campaigns implemented in recent years: there is a focus on the quality of traditional products, without any limitation by the parent company. In foreign countries outside the U.S., consumers have an increasingly wide range of products offered to them, to be consumed in places that are more elegant and comfortable than previously. These earlier outlets had rooms where the chairs were small and uncomfortable, implicitly inviting the consumer to consume food quickly. Now McDonald’s offers wi-fi, so the customer is given the opportunity to stay longer, enjoying Italian an McCafe. McDonald’s seems more and more focused on moving away from being a global brand, diluting their brand equity and moving away from its core competencies of a fast-food business. While in the short term this strategy may prove effective in penetrating a foreign market, in reality it may be damaging on a longer time scale, almost cutting its roots as a fast-food company. We certainly cannot say at this moment in which the evolutionary process has just begun whether McDonald’s has truly “changed skin.” We can however say that even a multinational success like McDonald’s (which is seen as more than a product, rather a promoter of globalization) is becoming an example of the evolution of traditional multinationals into a ever-more “glocal” reality, finding in globalization and localization the factors that give it a strategic approach more suitable for a global market.